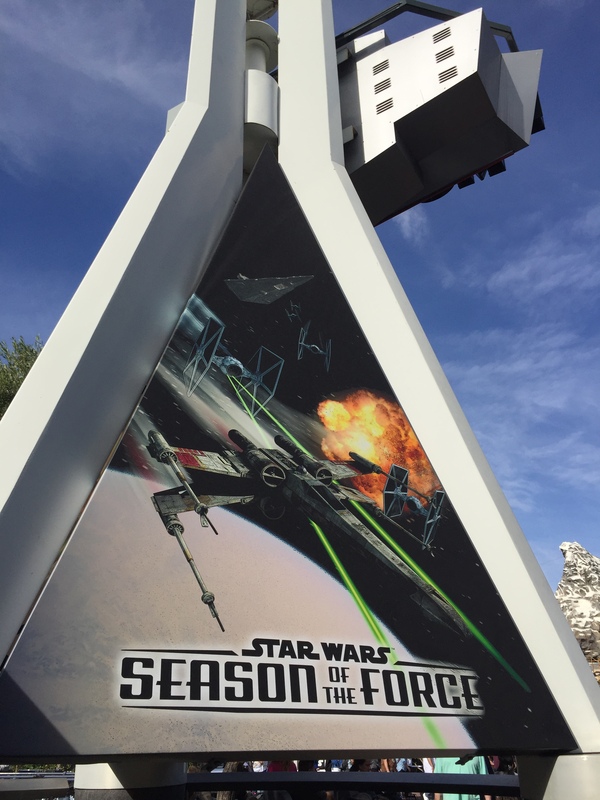 EDITOR’S NOTE: This is the second in a two-part post exploring Star Wars: Season of the Force at the Disneyland theme park. Read the first post here. 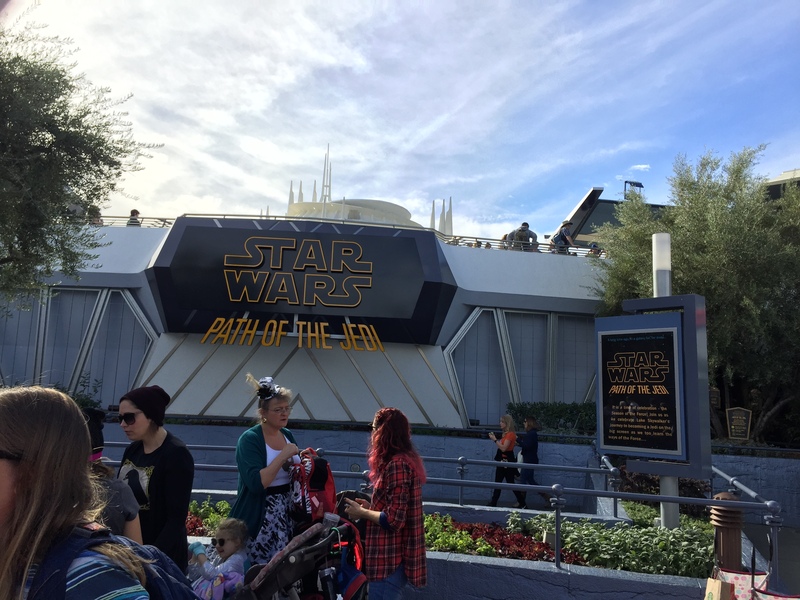 SPOILER ALERT: If you’re planning to visit Disneyland and want to be surprised when you experience Season of the Force, you may want to skip this post for now. 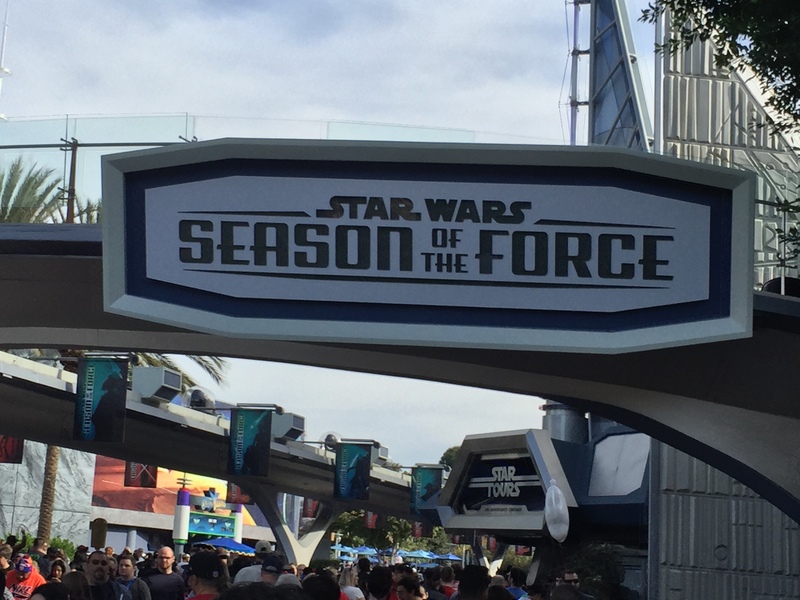 I was skeptical about the idea of Star Wars: Season of the Force, just as I am skeptical about every new element Disney introduces to its Southern California theme park. What can I say? I’m a traditionalist. I’m nostalgic. I’m slow to accept change. 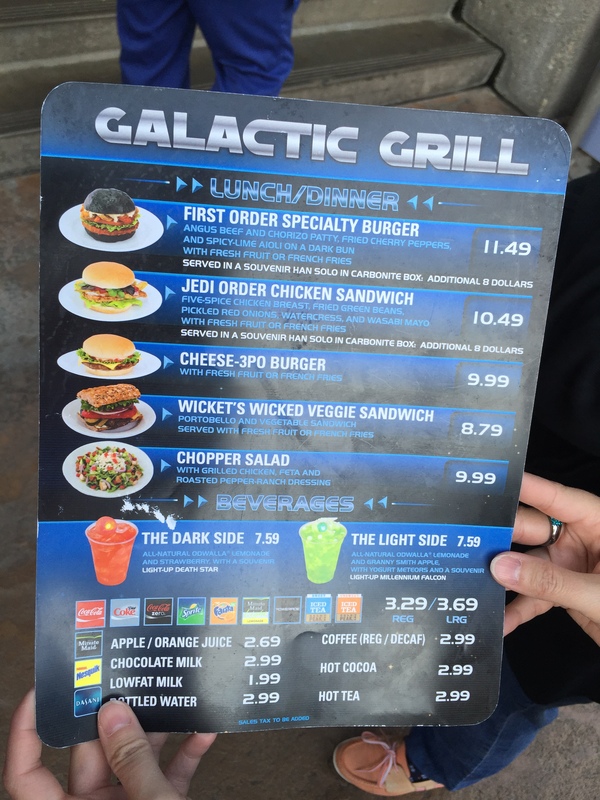 As almost always happens, however, I was impressed with this new addition to Disneyland, an appetizer designed to tide us over until the future Star Wars land materializes. 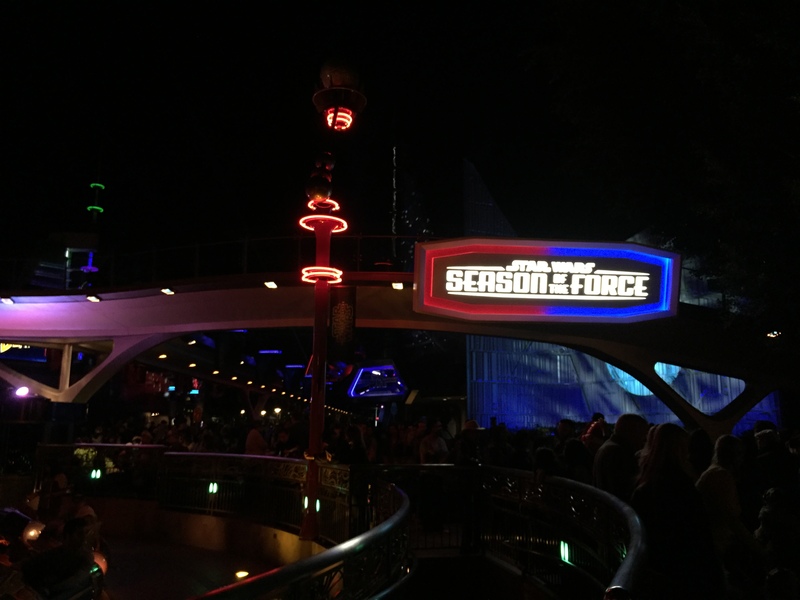 Season of the Force essentially transforms the generically sci-fi themed Tomorrowland into a temporary Star Wars land, complete with ambiance, attractions, “character experiences,” food and enough merchandise to make your head explode. 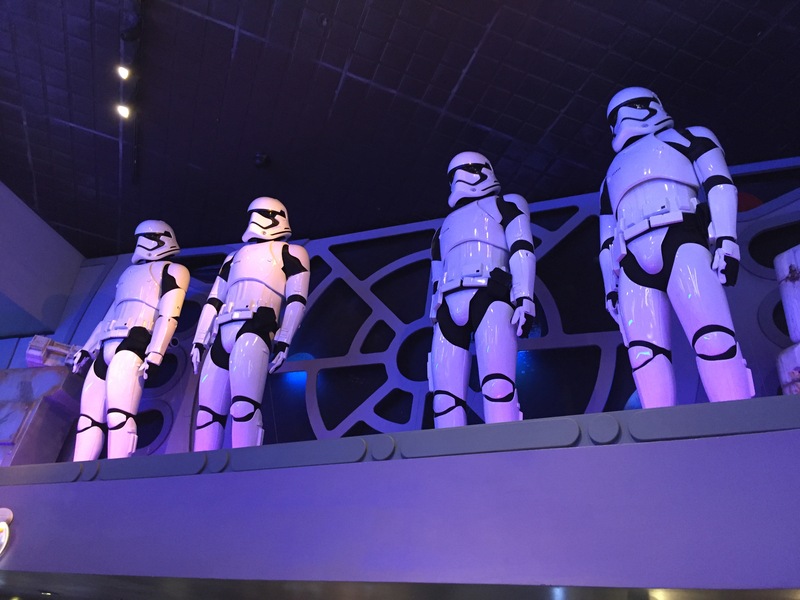 This event boasts Disney’s signature attention to detail. It’s fun to explore and discover new things. 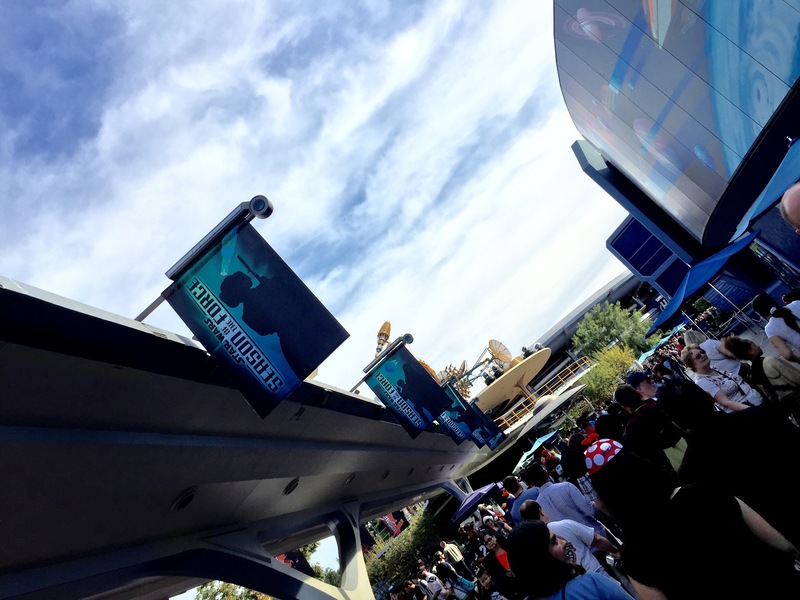 Immediately upon entering Tomorrowland you’ll notice the Star Wars makeover. John Williams’ signature score plays throughout the area and you’ll find interesting touches everywhere. 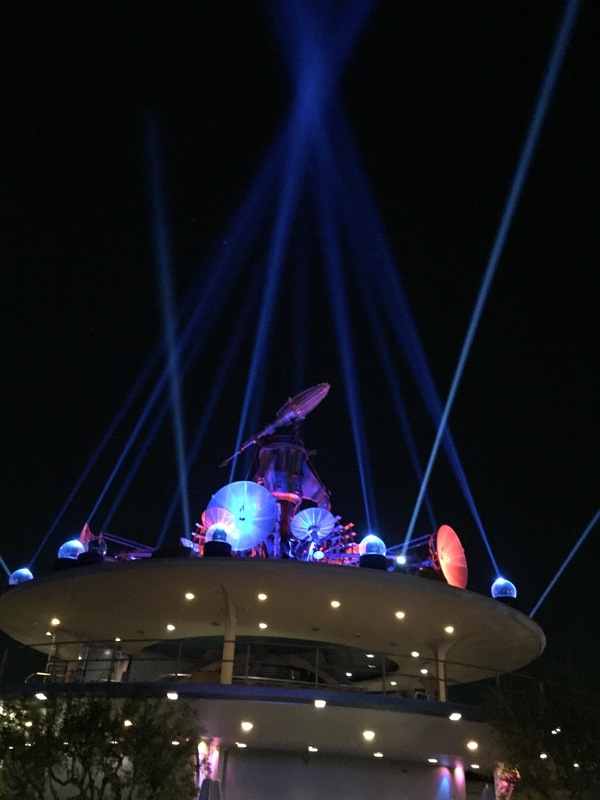 Visiting Tomorrowland at night is a must if you want to really appreciate the ambiance. 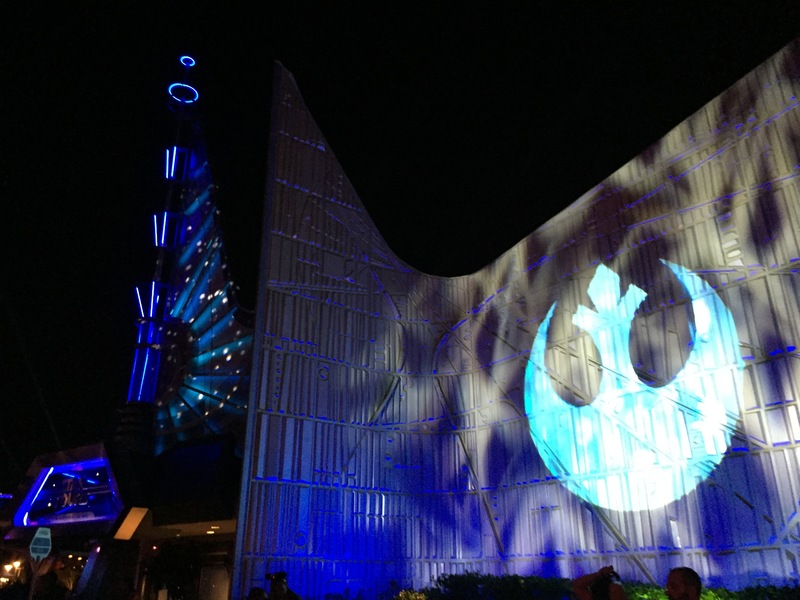 The area is divided into the Dark Side and the Light Side with creative lighting effects and banners featuring characters from the franchise’s many incarnations. 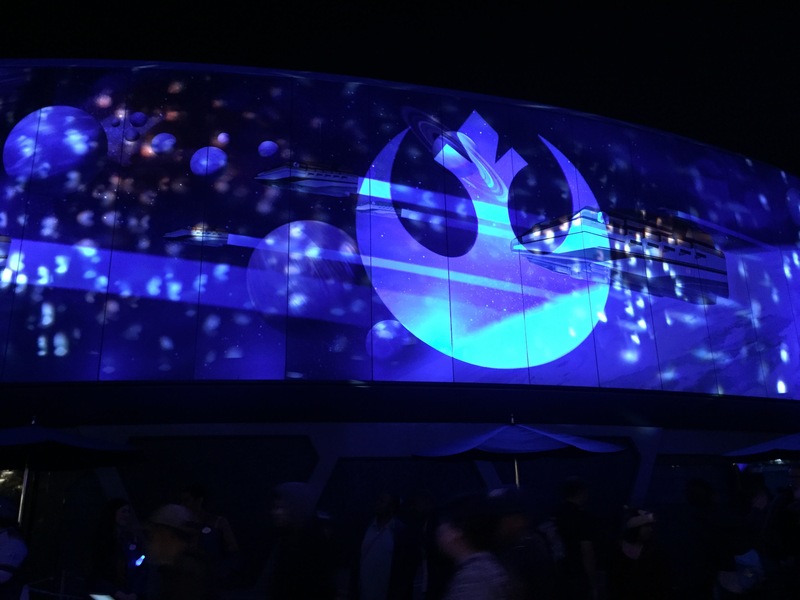 The Galactic Empire’s logo is projected across one of Tomorrowland’s murals. Beams evocative of lightsabers shoot into the night sky. 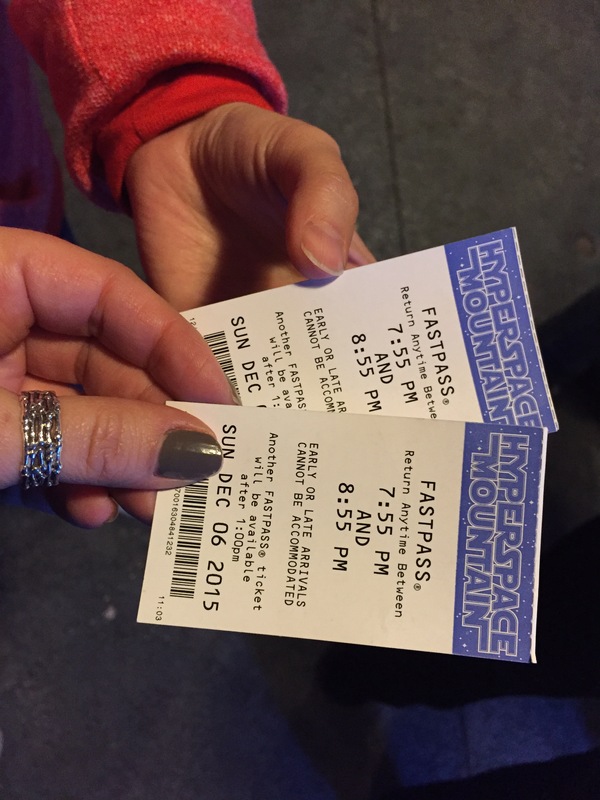 Disney has transformed its classic Space Mountain roller coaster into Hyperspace Mountain. The wait for the ride was two and a half to three hours long, but FastPasses were available at the beginning of the day. 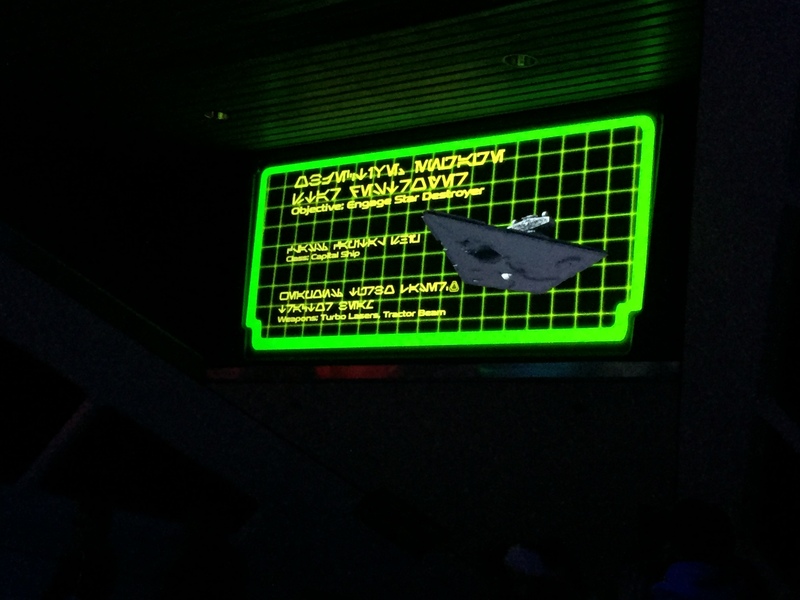 The queue for Hyperspace Mountain features added Star Wars graphics. Admiral Ackbar addresses those waiting, informing them they are about to participate in a battle as part of the Rebel Alliance’s Blue Squadron. I won’t spoil what happens inside the ride. Suffice it to say, it features great use of John William’s famous opening trumpet burst. 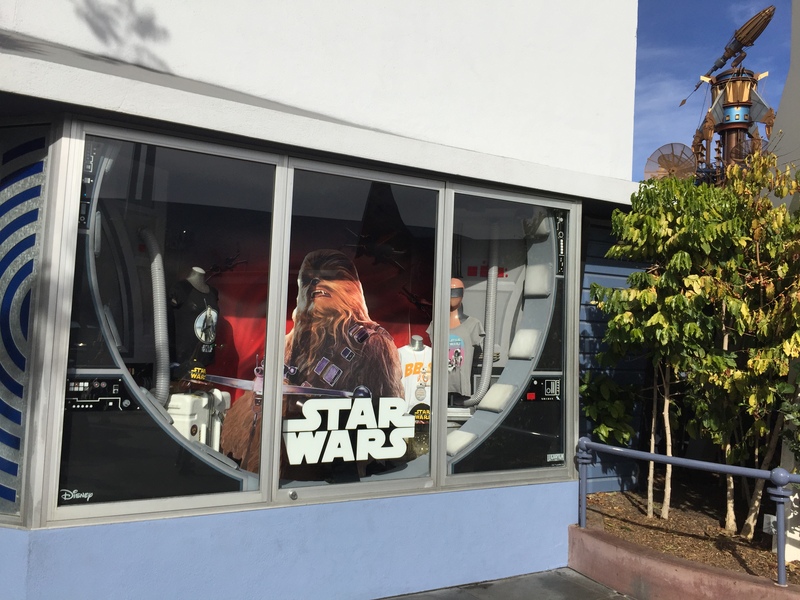 I opted not to check out Path of the Jedi, a new show in the Tomorrowland Theater that features “favorite scenes” in a “celebration of the entire Star Wars saga,” according to Disney. Season of the Force’s hottest food item is the BB-8 Sipper, the cutest sippy cup you’ll ever slurp soda from. It retails for $13.99 and is available at the PizzaPort restaurant. Some enterprising people are already selling it on eBay for upwards of $20. See, you can’t resist him. 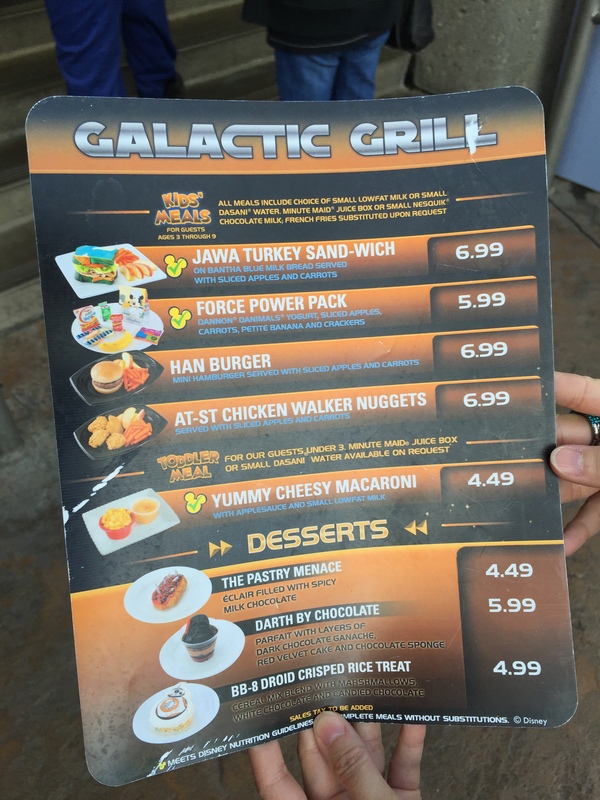 The Galactic Grill features an all-Star Wars menu, which includes the Han Burger, The Pastry Menace, Darth By Chocolate, the Cheese-3PO Burger and Wicket’s Wicked Veggie Sandwich. The grill continues to host the former Jedi Training Academy, now dubbed Jedi Training: Trials of the Temple. 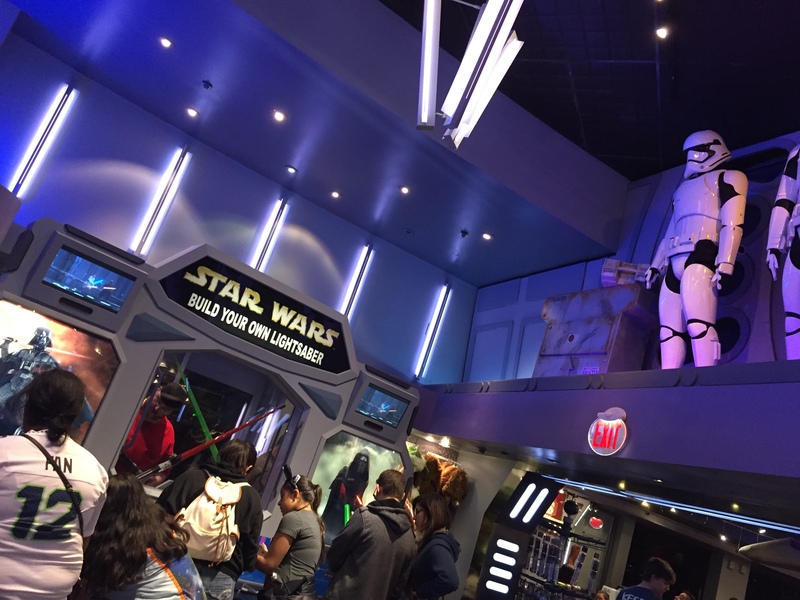 If your kid wants to participate, you now must “preregister” him or her at a kiosk at the Star Wars Launch Bay. 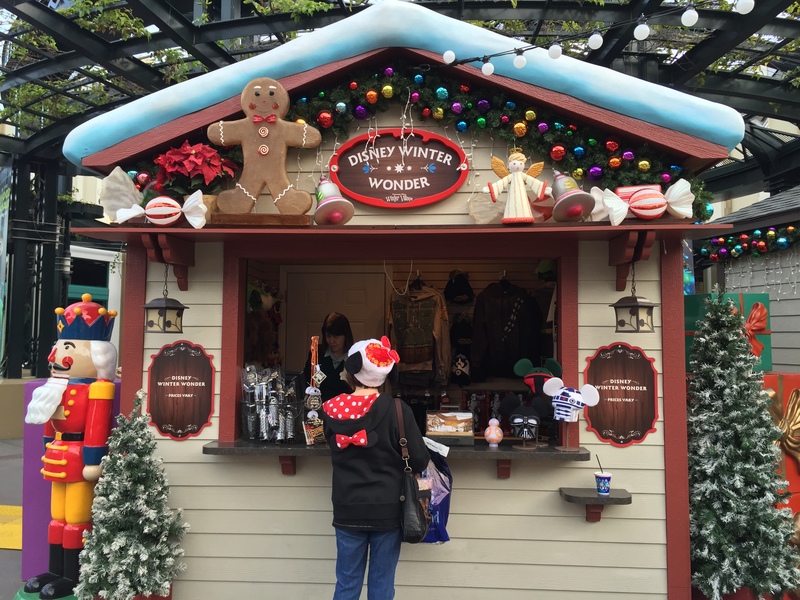 It wouldn’t be Disneyland without a gift shop around every corner and copious amounts of merchandise tempting you to open your rapidly thinning wallet, now would it? 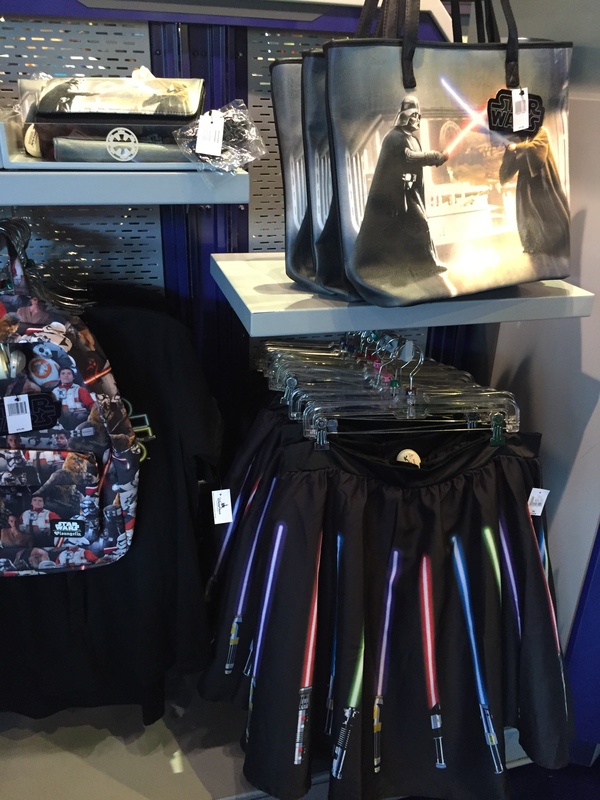 The sheer scope of the Star Wars items available in Tomorrowland and throughout the park, as well as Downtown Disney, is almost impossible to comprehend. So much Star Wars stuff! So much! 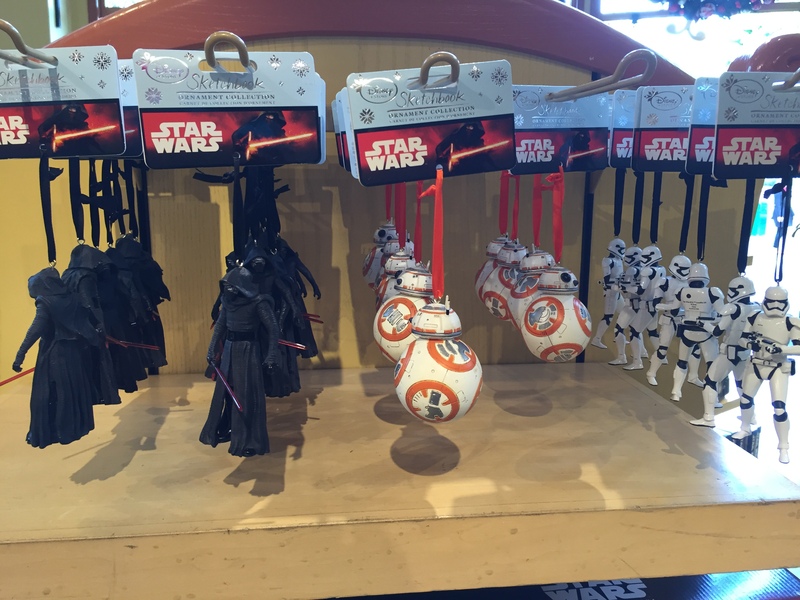 One of the best new items can be found in a little shop across from the Star Wars Launch Bay. There you can pick out a unique faux leather bracelet and have it personalized with your name or text of your choice in Aurebesh, the Star Wars basic language. 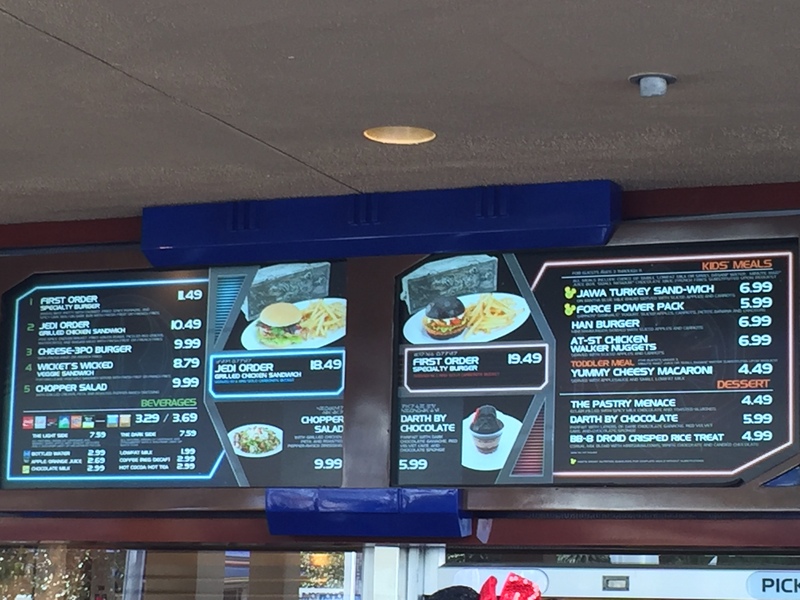 The Star Trader used to feature general Disney merchandise, along with items from Star Wars and Star Tours. It is now exclusively dedicated to a dizzying array of Star Wars stuff. … and the most hideous shoes ever invented. Make sure to spend as much as you can. The Evil Galactic Empire is watching you! If you can’t find what you’re looking for inside Disneyland, you’ll certainly find it in the Downtown Disney shopping area. 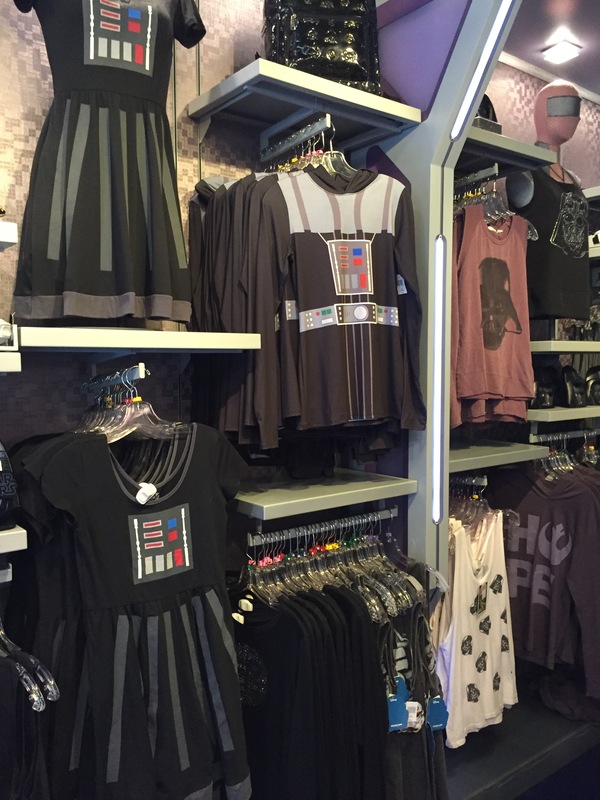 The World of Disney store has a whole section dedicated to Star Wars and it features a surprising amount of items dedicated to Rey. The Sanuk shop features these knee socks, which will go beautifully with your Her Universe lightsaber skirt. 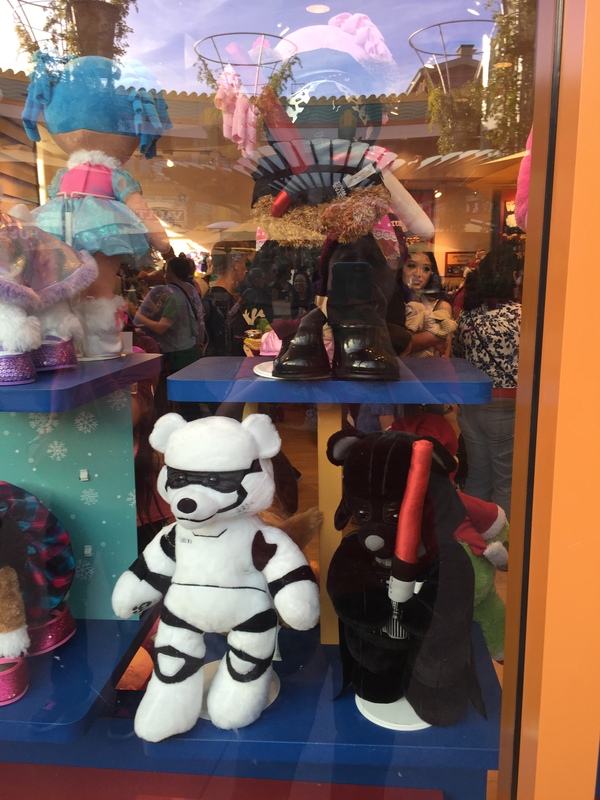 Build-A-Bear Workshop features customizable Star Wars teddies. 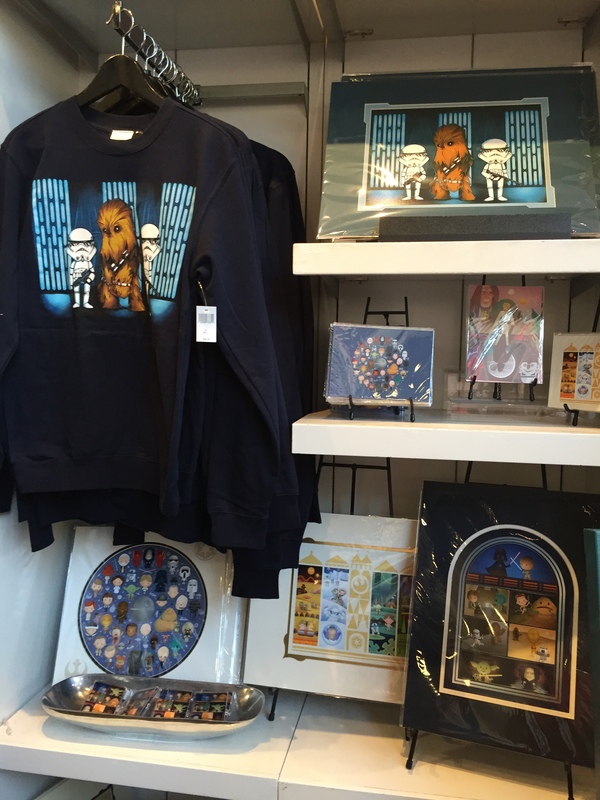 WonderGround Gallery has a Star Wars collection. 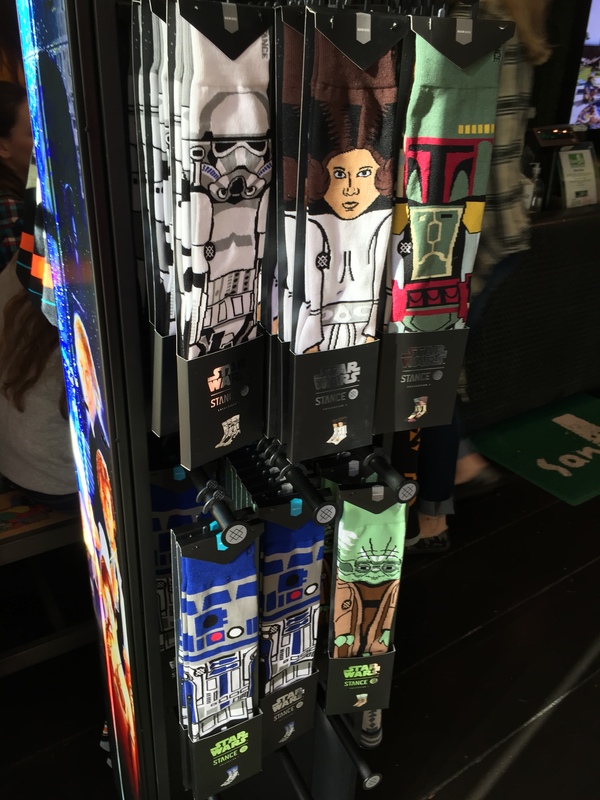 Just in case you forgot something, this Christmas kiosk is fully stocked with everything Star Wars, too. 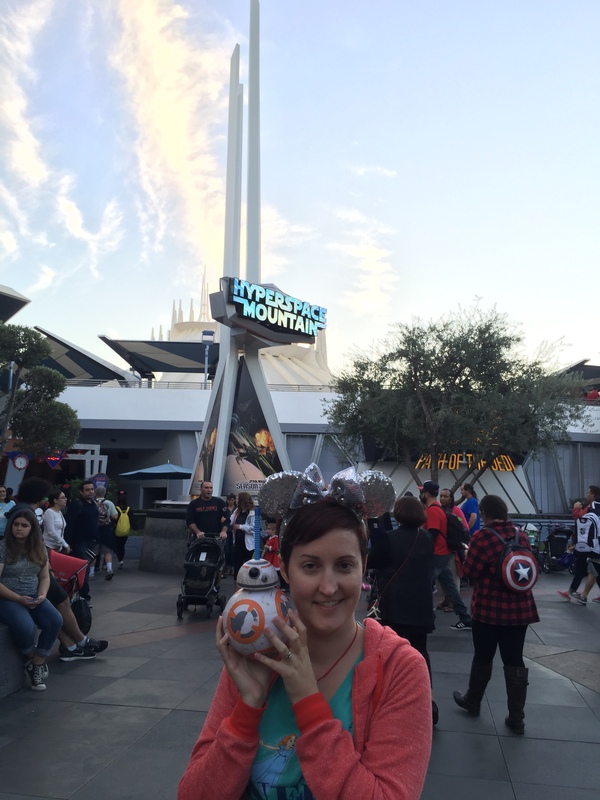 This entry was posted in Uncategorized and tagged BB8, Disneyland, Downtown Disney, Her Universe, Hyperspace Mountain, Jedi Training Academy, John Williams, Lego, Path of the Jedi, Season of the Force, Star Tours, Star Wars, The Force Awakens, Tomorrowland on December 9, 2015 by Lavender Vroman. Since Force Friday unleashed a seemingly endless blitz of Star Wars merchandise onto store shelves, you’d think it would be easier than ever to shop for fans of George Lucas’ sci-fi saga. But there’s so much stuff out there (and a lot of it is just cheap crap, if you’ll pardon me for saying so), it can be overwhelming and frustrating to sort through the piles and piles of collectibles, toys, T-shirts, action figures, and other goodies. 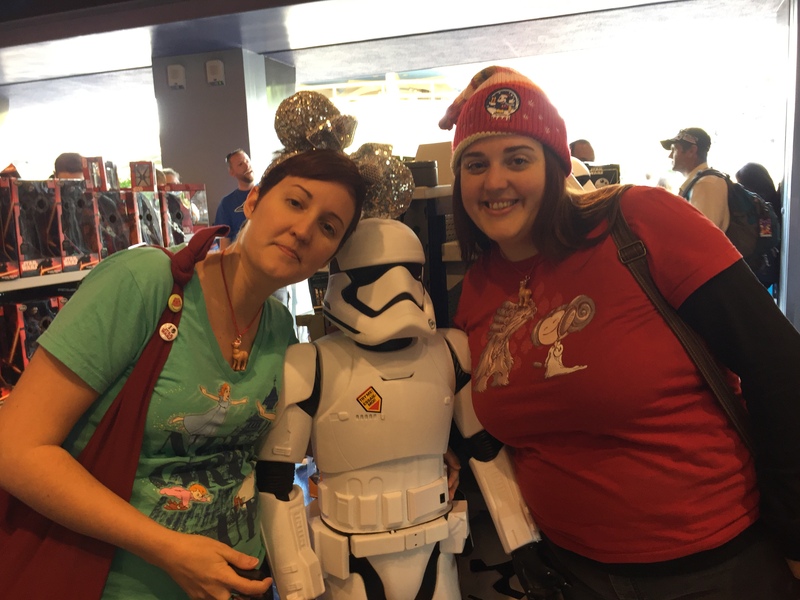 Fortunately, we’ve simplified the Star Wars gift-buying experience by picking out a few of the most promising buys to be found this holiday season. Here’s an easy guide to finding that perfect Star Wars-themed Christmas gift. May the force be with you, and your days be merry and bright. 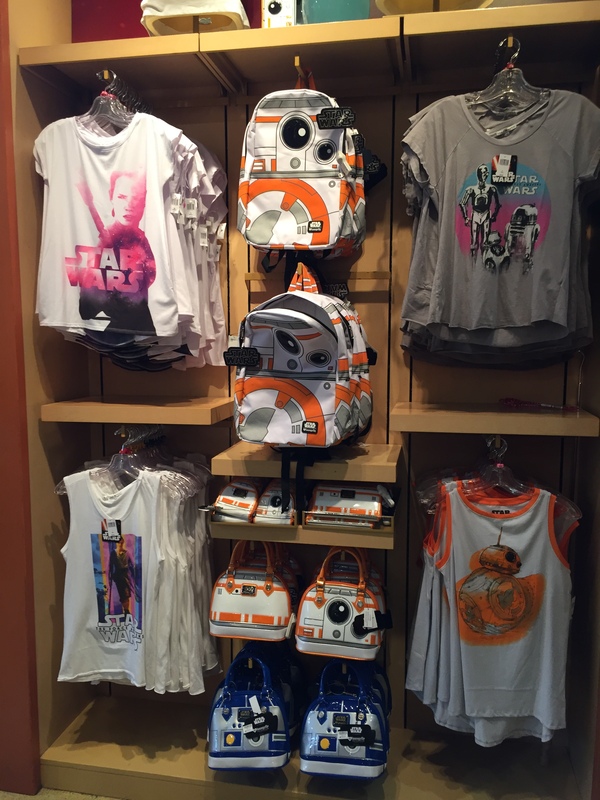 When the new Episode VII merchandise was released on Force Friday, the belle of the ball was undoubtedly BB-8. 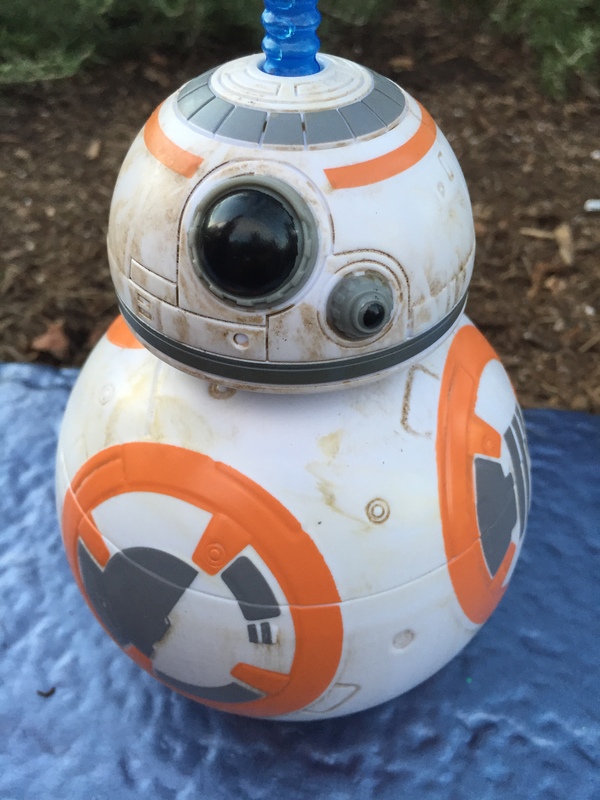 The Sphero BB-8 App Enabled Droid is as close as you can get to owning your own droid. You can guide him with a smartphone or tablet. He recognizes and reacts to your voice and records and plays virtual holographic videos. Plus, the rotund little guy’s attitudes and actions evolve as you interact with him. $149.95. Get it here. And if you can’t shell out $150? 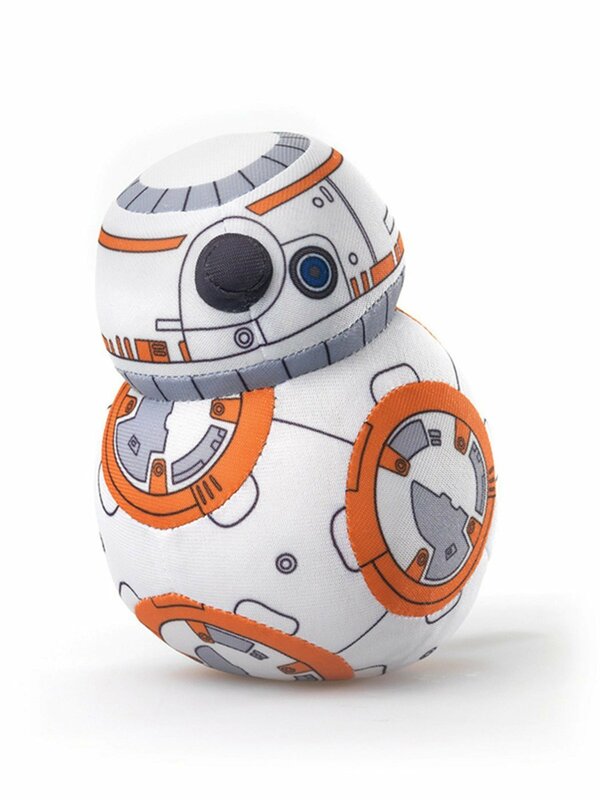 A more affordable option for BB-8 admirers — the Star Wars Episode VII The Force Awakens BB-8 Super Plush. $15.67. Find it here. Give that young Jedi in your life the coolest new weapon wielded in The Force Awakens. The Star Wars The Force Awakens Kylo Ren Deluxe Electronic Lightsaber extends with a flick of the wrist and simulates classic lights and sounds. $29.99. Buy it here. What better way to prepare for The Force Awakens than by revisiting George Lucas’ original trilogies? 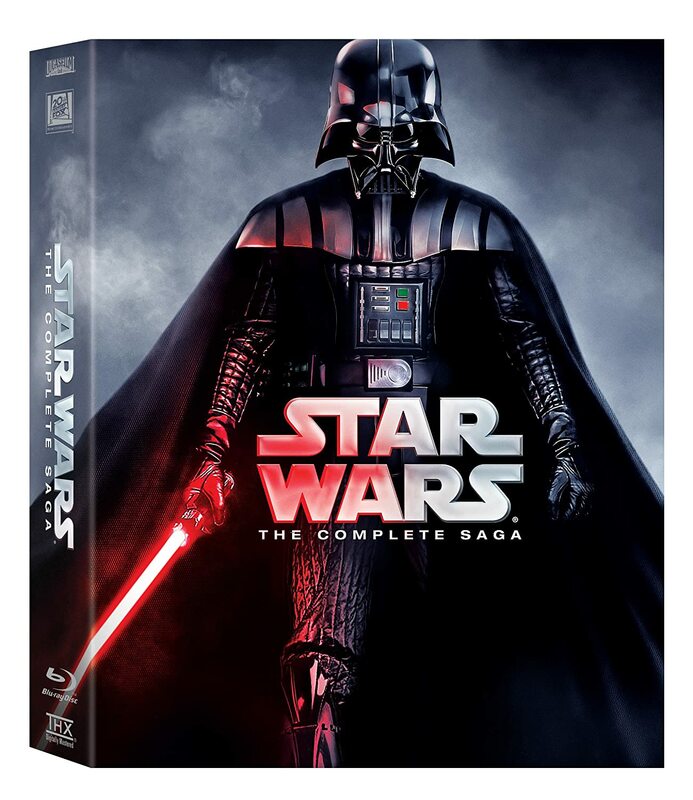 Star Wars: The Complete Saga (Episodes I-VI) [Blu-ray] presents all six movies in high definition, along with 40 hours of special features. $84.99. Get it here. Kids can recreate the classic Episode IV escape scene with Playskool Heroes Star Wars Millennium Falcon. This starter kit of sorts includes a push-activated blaster cannon, sensor dish, and ladder, and three figures, Han Solo, Chewbacca and R2-D2. Other sets are available too, including Endor Adventure and Echo Base Encounter. $39.99. Find it here. Train up young Padawans in the ways of the Force with the Star Wars Little Golden Book Boxed Set. Six books recount the stories of Episodes I-VI. $24.99. Buy it here. 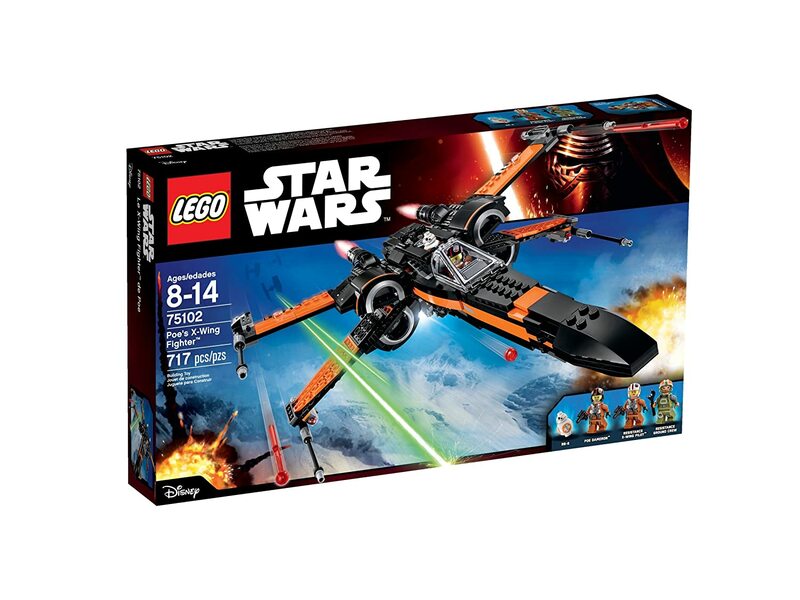 Collectors and little builders will find a multitude of Star Wars Lego sets to choose from at shop.lego.com. We’re especially fond of Poe’s X-Wing Fighter. It’s equipped with spring-loaded shooters, stud shooters, retractable landing gear, opening wings and more. $79.99. Get it here. Fandom meets high fashion with Rock & Republic’s Star Wars R2-D2 Embellished Tee, shimmering with a rhinestone graphic of the most lovable droid in the universe. 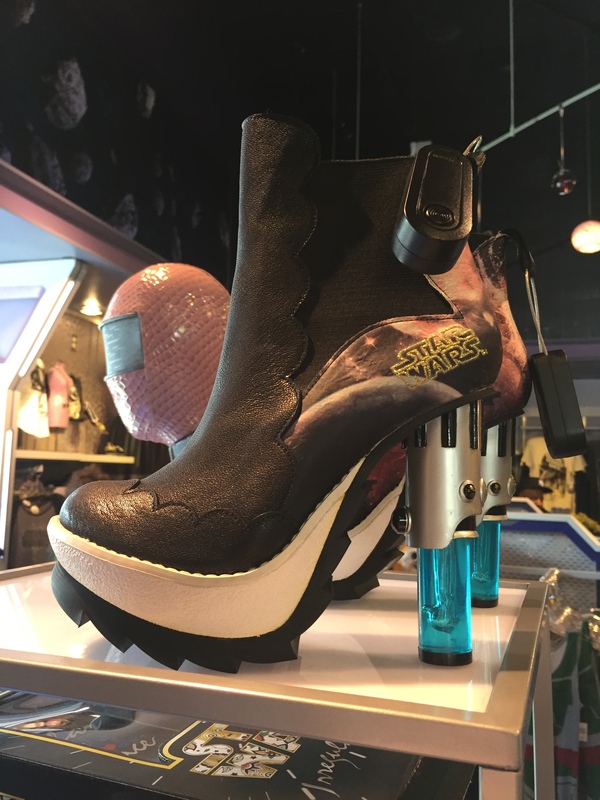 Other glam Star Wars inspired designs are also available. $19.99. Find it here. Every Star Wars fan should have their own lightsaber. And the closest thing to owning the real thing comes courtesy of Force FX. 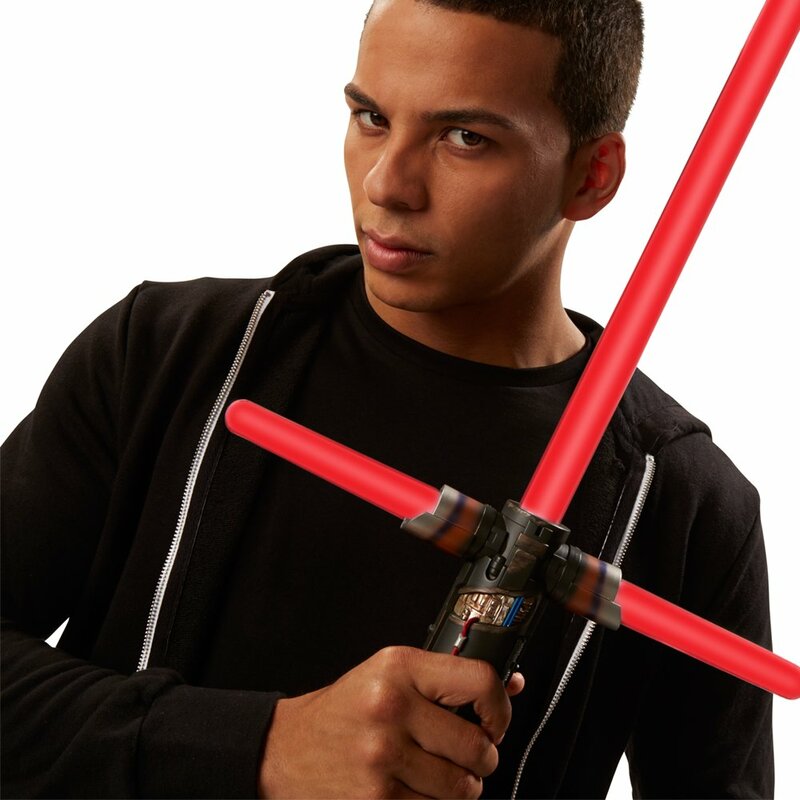 May we recommend the Star Wars The Black Series Kylo Ren Force FX Deluxe Lightsaber? It features realistic light effects, movie sound effects, three blades, a metal hilt and a display stand. Whether you sway toward the dark or the light side, Force FX offers many other varieties of the Jedi’s signature weapon as well. $199.99. Buy it here. 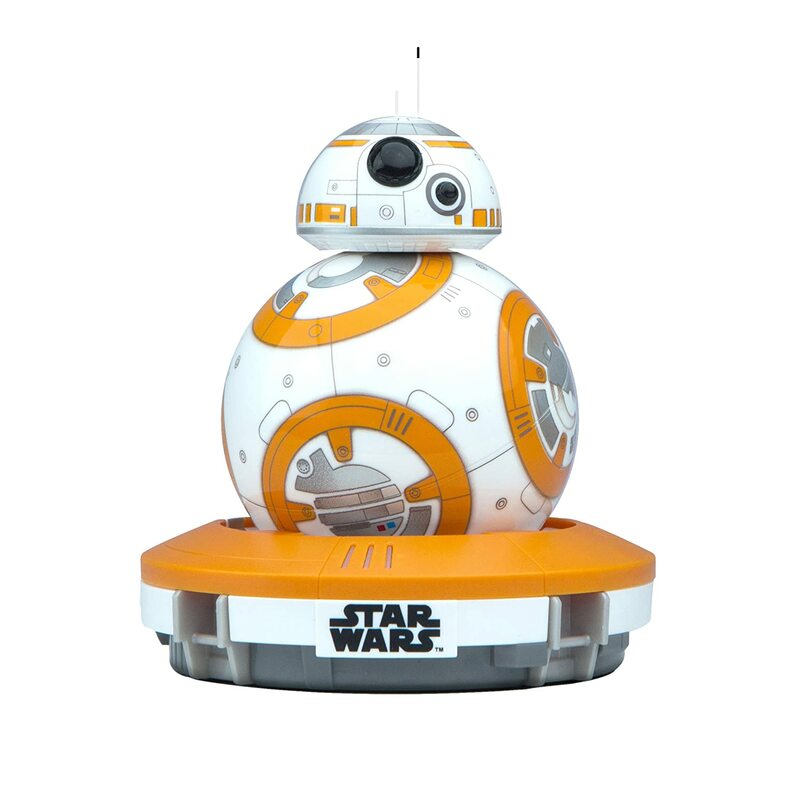 Who wouldn’t want to see Luke Skywalker’s peppy little droid first thing in the morning? 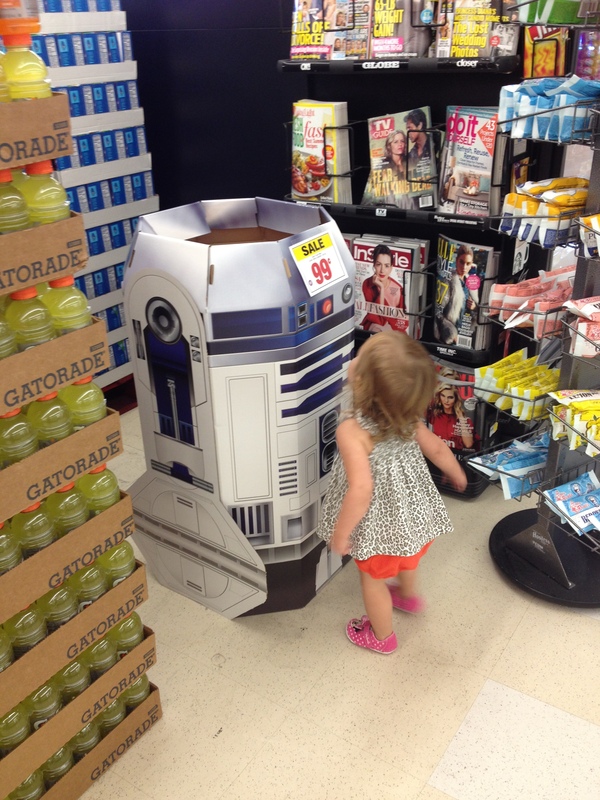 Soaping up has never been more fun with Oxygenics Star Wars R2-D2 3-Spray Fixed Showerhead. It features three different spray settings. There’s also a Darth Vader handheld version. $24.99. Get it here. Carry Artoo with you wherever you go with the Star Wars R2-D2 Mini Dome Bag. The faux leather tote costs $68. Find it here. 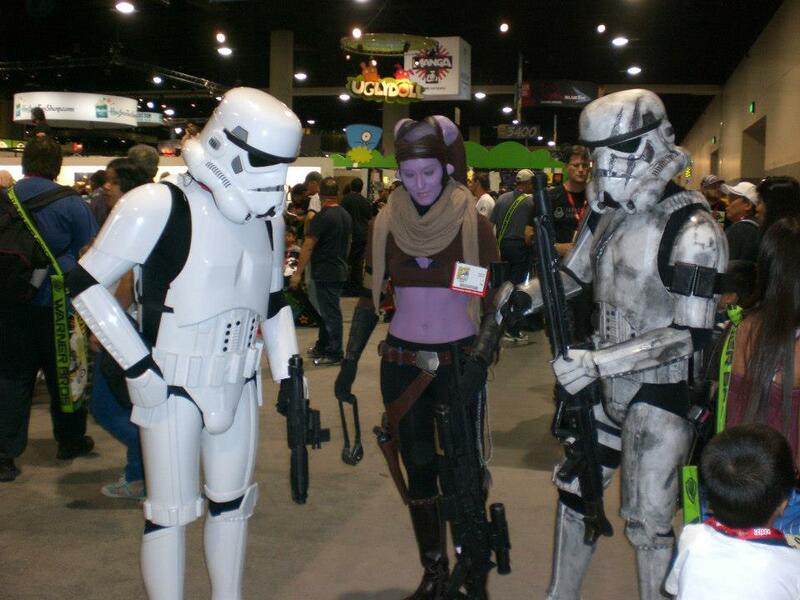 Want to put a little mystery into your favorite Star Wars fan’s life? The HeroBox Star Wars Saga Silver Edition 2.0 ships 70 bucks worth of surprise Star Wars goodies, including a T-shirt, to their door. $49. ($69 for the Gold Edition.) Buy it here. Ain’t no party like a party with Star Wars Death Star Chip & Dip Bowls. Each bowl holds 64 oz. There’s also a version starring Artoo and Threepio. $11.99. Get it here. Declare your undying affection for that special someone, Han and Leia-style, with these matching I Love You/I Know Rings. The engraved surgical stainless steel bands come in sizes 5 to 11. 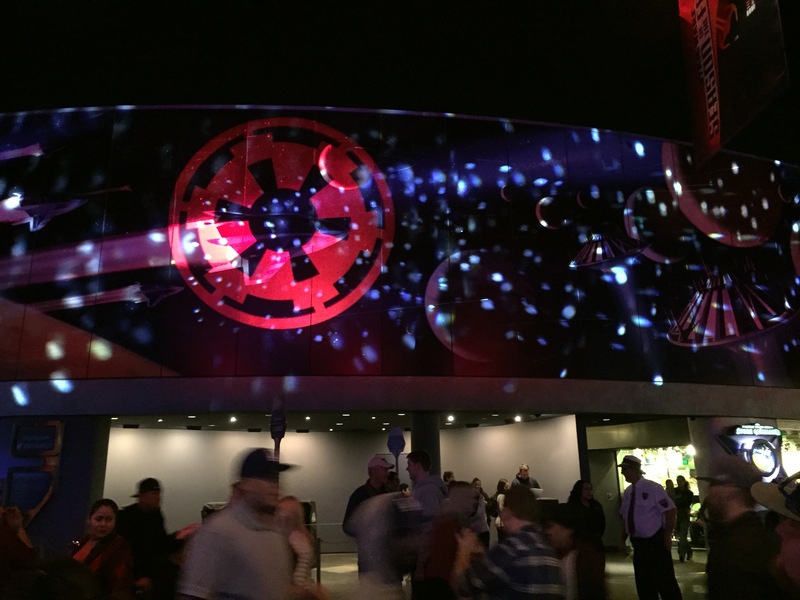 The Rebel Alliance symbol is emblazoned inside. $19.99. Find it here. One of the hottest gifts for gamers this season is the new Disney Infinity: Star Wars: The Force Awakens Play Set (3.0 Edition). It features a pair of Rey and Finn figures. Other characters are sold separately. 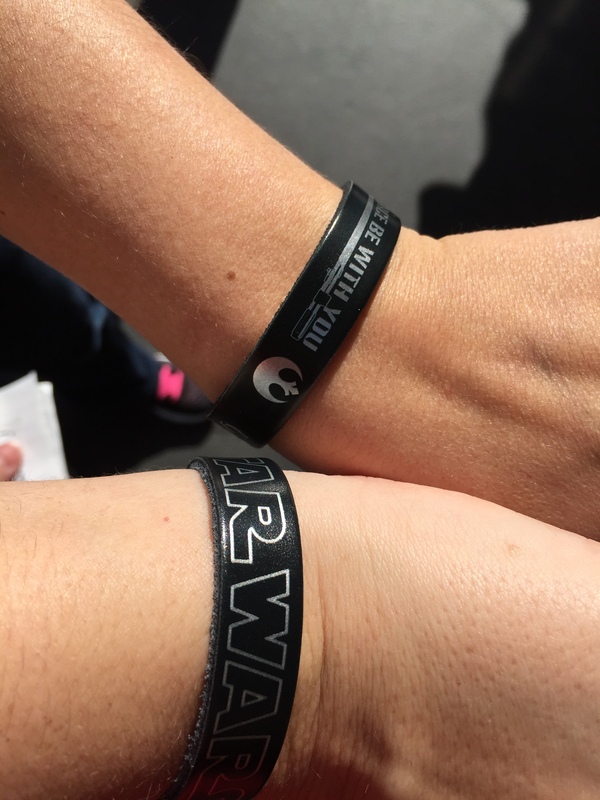 The set won’t be available until The Force Awakens officially opens in theaters on Dec. 18. $34.99. Preorder it here. 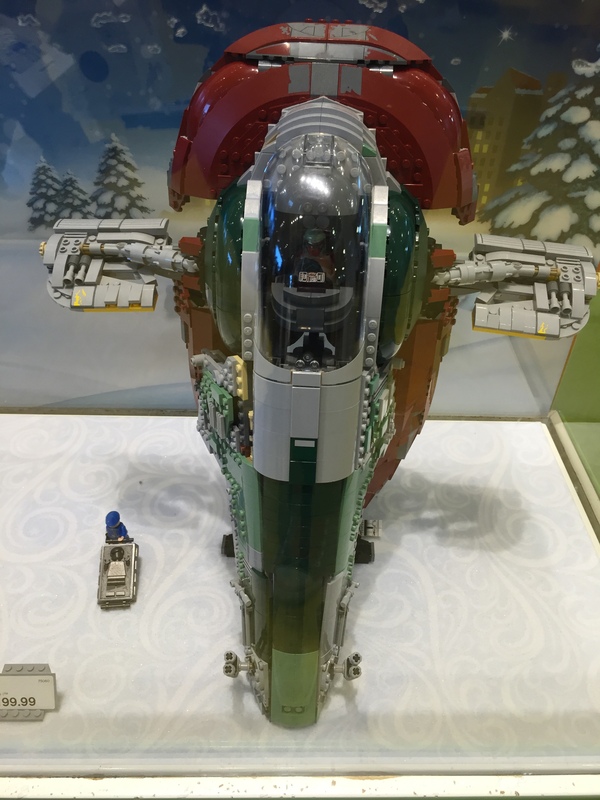 This entry was posted in Uncategorized and tagged BB8, Christmas gift guide, Christmas gifts, Disney Infinity, Force FX, George Lucas, Kylo Ren, Lego, lightsaber, Little Golden Books, Millennium Falcon, R2D2, Star Wars, The Force Awakens on November 28, 2015 by Lavender Vroman.